Street Art Tours are all rage in the East End of London with visitors to the area keen to know where to spot the latest street art. Following the breakout success of the likes of Banksy, Stik, ROA and Ben Eine street art is no longer an exclusively urban art. Shoreditch of course is one of the best places to see it and anyone serious about finding art need go no further from this funky part of East London, just on the outskirts of the city. This is the epicentre of the street art scene in the city and it just so happens we’ve written a handy little tour to help you find some of the best places. On exiting Shoreditch High Street station you’ll come straight out onto Braithwaite Street. The Street itself is quite interesting, if you turn right and head through the railway tunnel you’ll come to a few walls which are quite colourful and have a good view of the towering buildings of the city just behind. This particular street is also very often used for photoshoots so don’t be surprised if you come across some fashionistas or a hip hop crew filming a new video. For this tour though you need to turn left which brings you onto Bethnal Green Road and the turning onto Scalter Street. 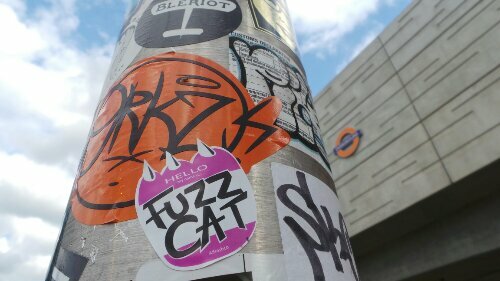 At Bethnal Green Road, turn immediately right onto Sclater Street. There is often a market of sorts and all kinds of art can be spotted on the walls around here. 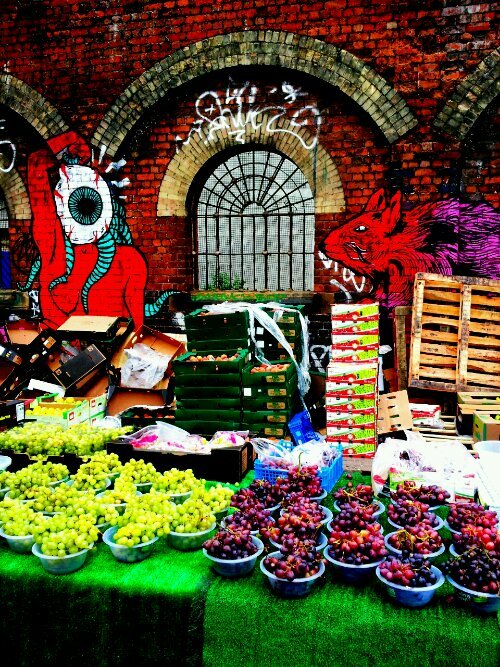 Head down Sclater Street towards Brick Lane and along the way you’ll see plenty of street art. This street can be busy with market traders so sometimes the art will be covered but during the week and in the evenings it’s usually okay. 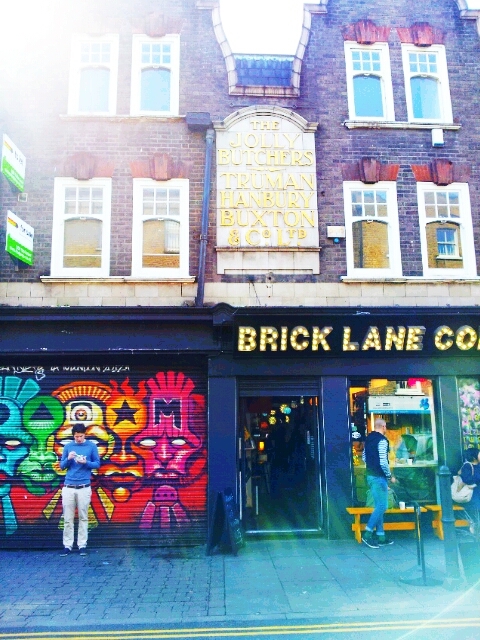 At the end of Sclater Street you’ll come out onto the famous Brick Lane which is a hive of activity all the time. Another tour will take you along the full length of this famous road and you can find that here. On this one though the part you’ll come out on is full of trendy bars and coffee shops so if you did want to get a slice of cake and a drink then this is the place to do it. There is all sorts of street art here. Much of the art is on shutters which are open during the day so if you want to get the best views then return in the evening. Turn left and walk up to the junction with Bethnal Green Road. Cross over the road and you’ll come to the beginning of Redchurch Street. This little road heads off towards the left and often has a few pieces to see. It’s not a long road but it sure is a busy one with lots of bars and galleries. When you get to Club Row turn left and then right along Whitby Street opposite the Aubin Cinema. There are always some great murals here. Walk along Whitby Street and then when you get to Chance Street turn right. Chance Street currently has some magnificent work from ROA, Reka and MadC. Walk up until you return to Redchurch Street and continue your journey left along it. Carry on until the end passing Ebor Street along the way (which has fantastic work on it from Ben Eine) until you get to the Shoreditch High Street. Once at the Shoreditch High Street turn left and then cross at the crossing and head across the road to a little road called Holywell Lane. This is the location of the famous Village Underground which is regularly painted over by artists working with Street Art London. Artists who have painted this wall include Ben Eine, Ser, Sr.X, Fanakapan and Amara Por Dios. Carry on until Great Eastern Street and look left. There the panels on either side of the road are constantly being painted and often have something new. Numerous artists have painted here and sometimes the work lasts no more than a few days. Once you’ve had a good look carry on across Great Eastern Street until you reach Curtain Road. Walk right along Great Eastern Street where there will often be painted hoardings looking out for little gems on the streets either side. New Inn Yard is a particularly good little spot. Keep heading straight up and look out for the turning with Rivington Street to the left. There are plenty of bars and places to eat around this bit so if you want a night out this is the place to go. Once at the entrance turn left and walk to the end. There’s loads of good things to see on this street but the jewel in the crown is to be found in the outside Cargo, the trendy evening bar which used to play host to some of Banksy’s shows. 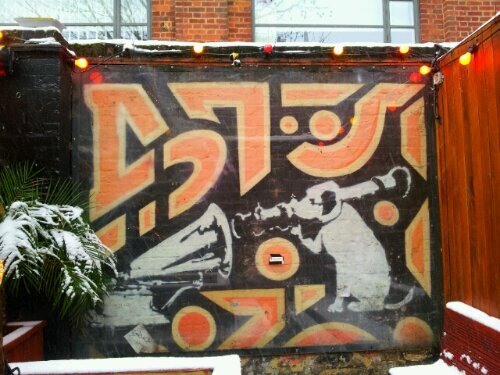 As a result it has two original Banksy’s and a bunch of other murals. It’s a must see. Keep going along Rivington Street and when you come to the end of Rivington Street you’ll notice works from a number of artists on the walls of the Red Gallery. It’s often closed or playing host to events but you can still see all the art dotted around. At the end of Rivington Street you’ll find yourself on Old Street. This is the end of the tour so if you want a quick route home head right along the street and towards Old Street station. Alternatively you could stick around and have a wander and see what else you can find. If you’re interested in a guided version of this or any other tours on Inspiring City feel free to contact me on the form below. I like Vhils and El Mac! Do you know of anyone who would be able to do a private tour of this on Sunday? It’s a birthday present for my Mum!